In my youth never did a B-western movie make it to the end without the bad guy being cornered and denounced for the “yellow-bellied sapsucker” he was. Yellow-belly and/or yellow-bellied has for various etymological reasons been associated with cowardice. Sapsucker, I don’t know, maybe it just sounds kinda lowlife. But in the avian world there is nothing cowardly nor lowlife about the yellow-bellied sapsucker, Sphyrapicus varius. This medium-sized (nine inches) woodpecker clearly isn’t (wasn’t) afraid to chart new territories. It can be found throughout all of North America plus many areas of Central America and the Caribbean. Colonies are also known from the United Kingdom and Greenland. This colorful woodpecker has a mottled black and white back, white rump, yellowish breast and belly and a black and white face. 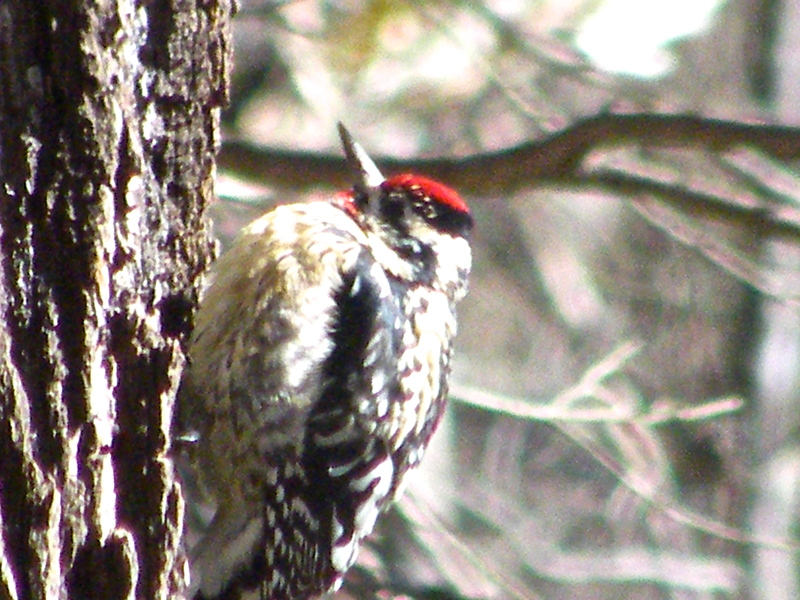 The male has a red throat and crown plus a large white stripe on the folded wing, which quickly differentiates it from our common downy and hairy woodpeckers. Sphyrapicus various once included two other species of sapsuckers but in 1983 the group was split into yellow-bellied, red-naped, Sphyrapicus nuchalis, and red-breasted, Sphyrapicus ruber. The normal nesting range for the yellow-bellied sapsucker is from Canada (east of the Rockies) to Labrador and Newfoundland; from South Dakota across Pennsylvania to New England and down the Appalachians to north Georgia. Most nesting birds in the Southern Appalachians are found from around 4,000 feet up but here in the area I found several pairs on the Thomas tract ( a privately owned tract of forest in Jackson County adjacent to Balsam Mountain Preserve) between 3,000 and 3,500 feet in elevation. At the time I was searching for sapsuckers for John Gerwin of the North Carolina Museum of Natural Sciences. Gerwin had been studying breeding sapsuckers in the Southern Appalachians to determine if they were perhaps a distinct species. DNA research, however, proved that the Appalachian birds were the same as the birds that nested in Canada and/or elsewhere. My home is at about 3,500 feet in elevation in the Plott Balsams and while I have never had a sapsucker in breeding season I almost always have one or more during the winter months. The faint drumming of sapsuckers as they excavate shallow wells to induce a welling of sap is distinctive. These busy drummers will literally ring trees with horizontal, evenly spaced shallow holes. The sapsuckers return to the wells and to lick up the sap plus whatever insects might have been attracted to the gooey goodness. The sapsucker’s drilling is, for the most part, not injurious to the tree but there can be exceptions. Sapsuckers are considered a keystone species with many other species taking advantage of the wells they drill. The three species of sapsuckers may hybridize in areas where their range overlaps. Should you find yourself in the woods in the winter be sure to set aside some quiet time to listen for the soft pecking of the yellow-bellied sapsucker it can greatly increase your chances of seeing this somewhat secretive forest dweller.